Tonga-born winger has made a sublime start to his rugby career whilst playing in Super Rugby. If you take a look at the Super Rugby standings at the moment, there is not a lot to cheer about if you are a fan of the Japan-based Sunwolves. Four games, four losses, to the Brumbies, Melbourne Rebels, Sharks and Lions respectively. But despite their poor form, one player is making waves in the competition for his creativity, crazy offloads, and sheer power. That man is Hosea Saumaki. His performance against the Lions, where the Sunwolves only narrowly lost 40-38, was particularly impressive. He set up one try by tackling Lions scrum-half Ross Cronje, and then simply picked up the ball and offloaded to a supporting player. Then in the 50th minute, he got on the score sheet himself. After receiving the ball near the halfway line, he shrugged off Andries Coetzee, took it past another Lion and scored in the corner. He looked truly unstoppable. Unfortunately, as mentioned above, the Sunwolves were unable to secure the victory but regardless, at only 25 years of age, Saumaki looks to be a huge talent for the future. Saumaki, nicknamed the ‘Tongan Godzilla’, has made it clear he wants to play for Japan at Test level, however he may have to use some loopholes to make that happen, especially when you note he has already played for the Tonga Sevens side. Having drawn comparisons to Jonah Lomu, Nemani Nadolo, and Julian Savea, wherever he ends up playing is sure to gain an incredibly talented player. The Sunwolves will look to get their first win of the 2018 Super Rugby tournament this weekend when they play the Chiefs, who are coming off two big wins against the Blues and the Bulls. A week later, the Sunwolves have a bye-week. 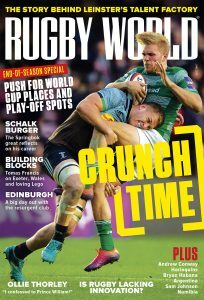 Don’t forget to follow Rugby World on Facebook, and Twitter.